Advanced Technocracy Inc. is Manufacturer, Exporter & Supplier of Solar Energy Demonstrator. MY Kit - Make It YourSelf Project Kit is a perfect and economical solution for any student Project. You need not only make presentable projects but can also design your own colorful panels. 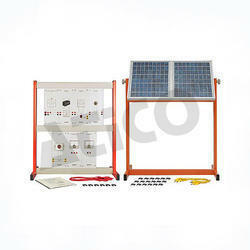 We are offering Solar Educational Kit. 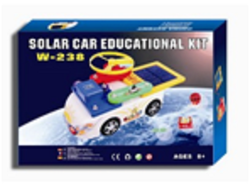 This is a good teaching aid suitable for younger children just starting to learn about solar energy. Can make and re-make up to 6 different systems Great brain stimulant for kids and adults: fun educational experience Recommended for ages 10+ Includes solar cell motor and pieces that can be assembled All pieces snap together easily. KEY FEATURES OF THIS KIT: This is a unique Do-It-Yourself kit which is ideally made for kids who love to build stuff. Its a fun way to teach kids how solar energy works. This shall enable you to explain the practical aspects of solar energy. Few hundred students of Std VII, VIII, IX and X will get the practical knowledge of solar energy & systems every year. Solar Energy and Educational Solar Kit - Solar Syatem Training Kits for educational lab equipment supplies, NaugraLabs Solar Kit Exporters. We are a well-renowned organization in the industry to provide our patrons the best quality array of Solar PV Educational Kit. To furnish the diverse requirements of our clients, we are involved in offering a wide range of Deluxe Solar Educational Kit. These are made under the supervision of our highly skilled professionals that ensures their superior quality. Moreover, these are available in fine packaging to render maximum client satisfaction. Mini Solar building kits teach children the benefits of solar energy while they create a toy that is both fun to play with and requires no batteries.